Video has become such a huge part of the Internet, that you see video ads almost everywhere. They’re in your Facebook feed, on the news sites you visit and on the mobile apps you use. However, there’s one place you still don’t see video a lot: email. And, you can expect that to change in 2017. Despite stats showing that including video in email marketing boosts open rates and engagement by a wide margin, few marketers are running video email campaigns. There are a couple of legitimate reasons why, but marketers should still explore this unexploited opportunity. You can make an easy case that adding video makes email marketing more effective. A recent survey, for instance, showed that consumers are 43% more likely to read email news. More recently, Forbes saw a 50% boost in click-throughs, shares and forwarding when it added video. Another recent survey found that video hiked open rates by 19% and CTRs by 65%. Such stats make intuitive sense. The average person gets 124 business emails a day. Much of that is spam and gets caught in filters. So when a consumer opts to receive emails from a brand and doesn’t filter them, then they are more open to that brand’s messaging. In a daily pile of 100 or so emails, video sticks out as a welcome respite from blocks of text. Marketers can enhance this novelty further by using GIFs as a play button rather than as a static image. All of this leads to the question, if email video is so great, why aren’t marketers using it more? Video email has been hyped since at least 2009. One practical reason has been that embedding a video in an email greatly increases its file size, which means that it will get bounced from some email systems. The other is the cost of email marketing. The CPMs for email are around $10 and open rates usually hover around 10–20%. That means if you’re targeting 1 million people, you’ll pay $10,000 to reach 100,000–200,000 consumers. There are cheaper ways to do this. Email costs also vary massively depending on volume and whether it’s a standard newsletter or a targeted send including dynamic content based on consumer data. Factor in the open rate, which usually hovers around 20%, and that means the true CPM is the 5X cost of the email send. The ROI can still be very good, but senders may have a slightly different cost in mind to what advertisers are used to for the ability to share their loyal audience’s attention. Finally, there’s the cost of creating videos. Unless your brand is already churning out videos, adding the cost of production can make video email marketing even more expensive, especially if you’re shooting for something slick. Whilst the total cost of email can be expensive this assumes you’re starting an email campaign from scratch. That’s usually not the case. Instead, brands most likely have an email outreach program in place. Adding video won’t budge your CPMs. Video can also be shot very cheaply, with a smartphone even, depending on what type of content you’re using. To address the file size issue, brands can and do use embedded links rather than including a video in the email itself. On the consumer end, the experience is seamless. 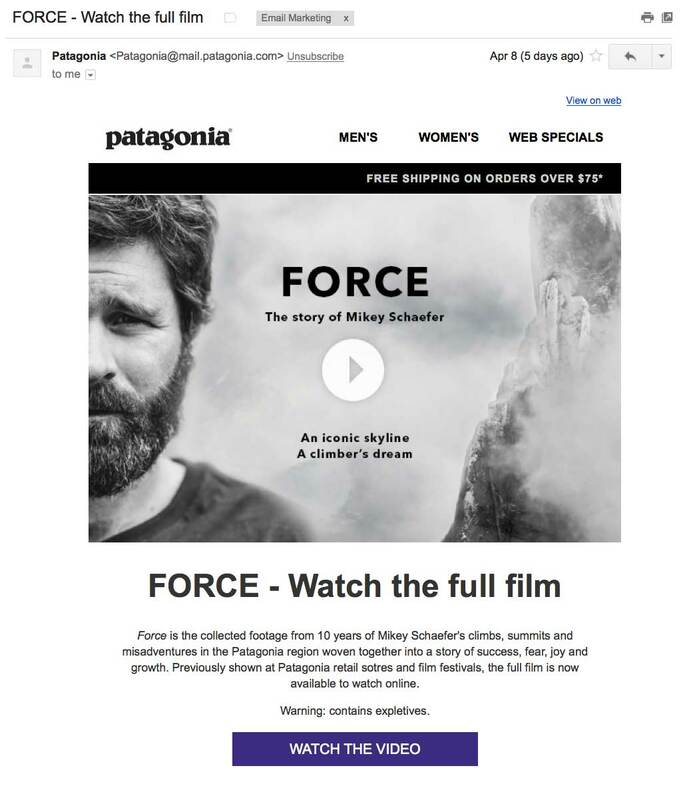 Several brands have overcome these perceived hurdles to create video email campaigns. One regular user is Patagonia, which shared a montage of 10 years of climber Mikey Schaefer’s greatest ascents and more recently directed fans to this video featuring Gobi Grizzly bear tracker Doug Chadwick . The best way to determine whether video email works is to try it yourself. Run emails with video and without and compare the KPIs. Tinker with the creative as well. Variables like content type, length and subject matter can have a huge impact on open rates. Given the proven benefits of video email and the low risk involved, you probably won’t be the only one experimenting this year. Mitch O’Callaghan is Account Director for the UK and EMEA at leading social video platform GlassView. Prior to his role at GlassView, Mitch was an email marketing specialist at email marketing company Brothermailer, a leading name in its field in the UK.